“To achieve world government, it is necessary to remove from the minds of men their individualism, loyalty to family tradition, national patriotism, and religious dogmas.” – Brock Chisholm, 1959 Humanist of the Year and former head of WHO. 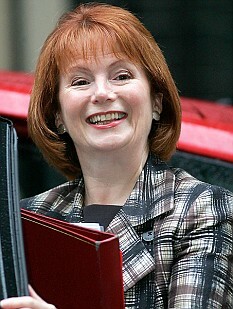 Communities Secretary Hazel Blears, the Labour minister who previously stated ‘it is common sense to sideline Christianity in favour of Islam‘ has announced a package of initiatives designed to use the state schooling system to indoctrinate our nations children against Britain and to ‘educate children on Islamic traditions and values’. Watch the videos below for a sample of the ‘Religion of PeaceTM‘. The liberal socialist self-loathing Hazel Blears wishes to actively promote this supremacist ideology in a secular nation, deliberately undermining Britain’s Christian heritage and encouraging a culture and religion that views our entire nation with contempt, believing it should be replaced by their own. There is NO DOUBT that Islam is completely incompatible with the British way of life, in fact it is incompatible with any nation that is not an Islamic theocracy. 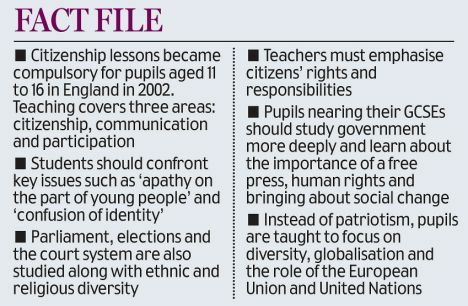 State school pupils are set to be taught Islamic traditions and values in compulsory citizenship lessons. The move – part of a package of initiatives announced by Communities Secretary Hazel Blears yesterday – is designed to curb extremism. Education campaigners warned however against giving Islam a privileged position over other faiths. Other plans announced by Miss Blears also drew criticism – including a state-funded panel of Islamic scholars and theologians to provide community leadership. Another measure will see Muslim children being taught citizenship lessons by imams in mosque schools – in the hope that they will be better equipped to resist extremist messages. Many Muslim youngsters in the UK attend evening classes at madrassah schools attached to mosques, where imams give instruction in the Koran and Islamic history. Ministers want imams to stress that the Koran places a duty on all Muslims to be good neighbours, carry out voluntary work and play an active part in civic society. That final point is impossible. The Koran places a duty on all Muslims to push for Sharia Law throughout the world, and to never trust non-Muslims (Kaffirs.) Such behaviour from the government does however fit into their Socialist/ One World Government mandate. It will create further social chaos, marginalise mainstream British culture and increase the burden of the taxpayer, especially with the EU’s Mediterranean Union coming online, with the potential of legalising the immigration of over 300 million more Muslims from Turkey and North Africa. At the present time, Muslims comprise less than 3% of the British population. Along with the huge increase in the building of Mosques in Britain (the construction of non-Islamic religious buildings is forbidden in Islamic states) these initiatives represent a disproportionate amount of attention being given to this fascist religion. It is also quite obvious that this is in no way beneficial to Britain and it an attack by proxy on our sovereignty. The continual push of Cultural Marxism through diversity, the enforced worship of the Communist/ Socialist Dictatorship of the EU and UN, the erasure of patriotism, of allegiance to ones nation, history and laws, this all adds up to the obvious goal of re-engineering British society around a One World Government framework. I do not know how much more evidence the British people need of this conspiracy to destroy this once great nation.